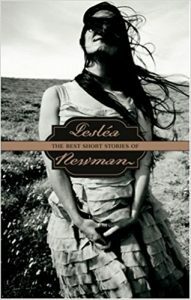 Best Short Stories of Lesléa Newman span the years 1988–2002, during which time she wrote six volumes of short stories: A Letter to Harvey Milk, Secrets, Every Woman’s Dream, Out of the Closet and Nothing to Wear, Girls Will Be Girls, and She Loves Me, She Loves Me Not. The stories cover a dazzling array of themes pertaining to contemporary lesbian life including long term relationships, one night stands, family of origin angst, motherhood, friendships with gay men, AIDS, breast cancer, bisexuality, aging, and loss. Many of these stories explore Jewish identity as well. In Newman’s prize-winning story, “A Letter to Harvey Milk,” Harry Weinberg, a 77 year old Holocaust survivor takes a writing class in which he unearths memories that force both him and his writing teacher, a Jewish lesbian, to see their lives. “Right Off the Bat” is a monologue, told by a twelve-year old girl whose lesbian mothers have been gay-bashed. “Eggs McMenopause” tells the story of how a sleep-deprived butch finds a unique solution to the trials and tribulations of menopause. In “The Babka Sisters,” a woman’s studies student interviews a nursing home resident and hears a tale the woman has never told anyone: the story of the girl she fell in love with in high school. And in “Mothers of Invention,” a couple tests their relationship when one woman decides she wants to have a baby and the other woman does not. Each story in this collection is told with Newman’s trademark wit, honesty, talent and compassion.